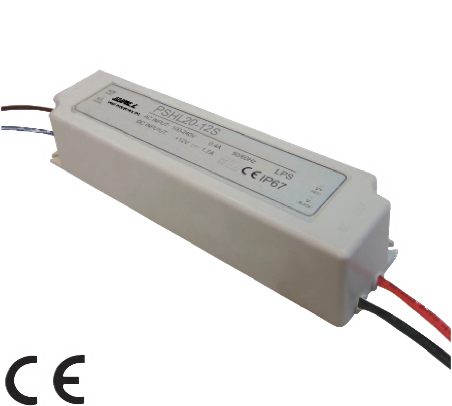 The PSHL20 series of LED drivers offers 20 watts of output power in a 5.83in x 1.57in x 1.18in package with plastic cover. This series consists of single output models with a universal AC Input range. Each model has built-in active PFC and constant current limiting current and has over load, over voltage, and short circuit protection. This series has UL 1310 class 2, UL 8750, EN60950, and EN61347 safety approvals and is suitable for outdoor LED lighting applications.